Congratulations Timothy! 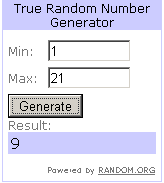 The number generator chose number 9. I will be contacting you on Sunday with the giftcard code. Thanks everyone for all the nice comments about me and my blog. It means a lot to me! :) Look for a new giveaway on Monday! Thanks for reading!